This is one of my favorite times of the year, the first of 4 major tennis tournaments! The 2012 Australian Open main draw kicks off on Monday, January 16th (qualifying already under way) with both men’s and women’s first rounds. Now, I’m sure most of you have filled out your draws and selected the winners, and I’m sure you’ve already been searching the interwebs for sites who have predicted the 2012 Australian Open winners, right? Hate to break it to you, you’re not going to find that here this year, in past predictions I’ve failed miserably at selecting winners, so instead I’m going to tell you who is NOT going to win the 2012 Australian Open on both sides. Obviously I’ll start with the qualifiers, they are not going to win. Period. End. Of. Story. Well, maybe a few of them will make it past the first round (and maybe even second round) of the main draw; I like Carsten Ball’s chance of winning a match or two, but not the distance. So that’s that. Andy Roddick had a less than notable 2011 tennis season, only taking home 1 title (Memphis) and not playing most of the end of the season. Let’s face it, Roddick doesn’t really pose a threat to anybody anymore; he’s kind of a “one trick” pony and that trick has been figured out…many times over already. Roddick will probably have a decent run up to the 16’s, but that’s where it’s over. Serena Williams, who did not play the 2011 Austrlian Open (foot injury), might have a chance in 2012 being seeded 12 she has a fairly open draw through to the quarters. She should win it, but I think her ego and lack of love for tennis might get in her way to victory lane. I’m not say that she will absolutely lose, though I think she has a better chance at not winning than actually winning, ya follow? Mardy Fish, I’m not really sure what I think about Mardy and his tennis. Yes, he had a pretty legit 2011 season breaking the top 10 for the first time in his career and he had some pretty notable wins over Davydenko, Nadal, Tipsarevic, Del Potro, and Ferrer. Though I have a hunch it’s just something that was a one season thing. Honestly, Fish doesn’t have the firepower to hurt the likes of Djokovic, Tsonga, and Federer; he certainly will try but I don’t think that he’s got the strength to win on this big of a stage; I call his loss in the third round. John Isner. Most, if not all, Americans think he’s a legitimate contender for a major title. I think so too, just not right now; his size and movement (he doesn’t move bad for his frame) are hurting him against some of the quicker players on tour, but his big serve and decent backhand are weapons big enough to do some damage. I think his 2010 Wimbledon first round match that broke all kinds of records, kinda fried his brain; I can’t imagine having to recover mentally from something like that. Isner will reach third round and bow out. Finally, there is Donald Young. Oh Donald…why so serious? For those of you who don’t know, Donald Young was supposed to be the “next top American” according to John McEnroe; most of us are still waiting for Donald to make a run. Yes, he’s done alright as a journeyman, but that’s just about it. He has a decent lefty game but it’s what’s in the heart that’s lacking, I don’t know if he doesn’t believe in himself or what, but he just starts to lose to himself. A pity really, gone in second round. Gael “the human highlight reel” Monfils. Yeah, awesome to watch, plays hard, hits big, but tends to play to the crowd a bit much, forgets he’s playing tennis, packing bags early. I would love nothing more than to see Monfils make a serious run at a major; I think he’s good for the sport, he’s animated and has fun, there’s just a time and place for that and the late rounds of tournaments is not the spot. Monfils has done OK in majors, reaching the semifinals at the French open…well yeah, he’s French. He’ll do ok, and probably reach the fourth round, but that will be a quick loss. Who’s that guy with the long name and kinda looks like Muhammad Ali? Oh, yeah, Jo-Wilfried Tsonga. I like his chances, he’s been a runner up down under in 2008 and he’s been hanging around the top 20 since his finals appearance. He has the firepower, the intelligence, the heart, and the ability to win a major, it’s just there are a few other guys out there that are just a bit better than him. I’m sure he’ll put up a good fight, but I don’t think he’s going to be a finalist, perhaps a semifinalist at best. Richard Gasquet, the “other” Frenchman. He’s still around and seeded? All sarcasm aside, he’s actually a decent player (great backhand) and has been on the tour long enough to outwit some of the younger players he’ll meet at the Aussie Open this year. He’s not much of a contender now for a title run, but he’ll fare well in the early rounds and get his points to keep his spot in the rankings. …I’m going to break this up into 2 posts, there are just so many players that will not win the 2012 Australian Open, that I can’t fit it into one post. 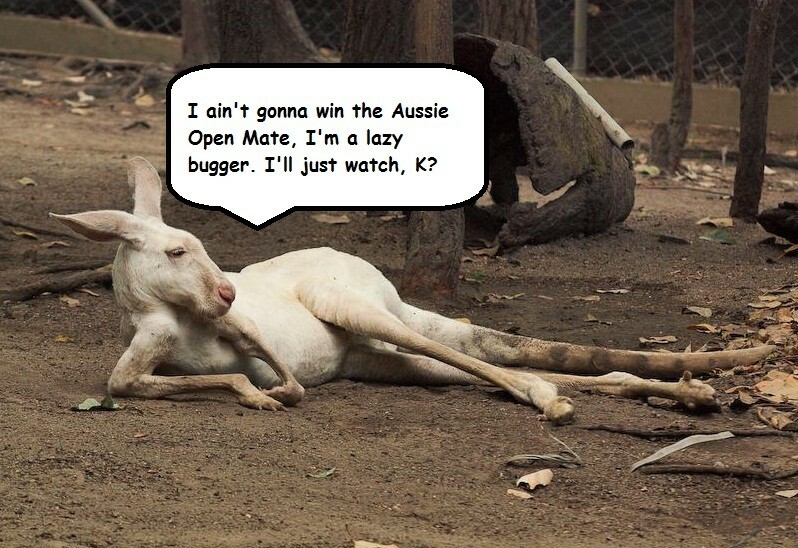 So check back tomorrow for part 2 of Who is not going to win the 2012 Australian Open!